On highscalability.com there is a great post on things you should do to prevent your web site from high scalability: “The 10 Deadly Sins Against Scalability“. The post points to Sean Hull who twitters and writes quite frequently on scalability topics (surprise, surprise). Sean Hull wrote in his blog about “5 things toxic to scalability” (2011) and “Five More Things Deadly to Scalability” (2013). Definitely worth reading entries on high scalability – and common pitfalls. 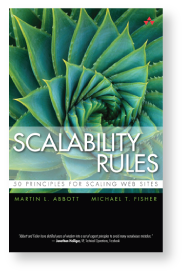 In the context of this topic, Sean also recommends a book: “Scalability Rules for managers and startups”. Very good reading to avoid all high-scalability pit-falls right from the beginning! This entry was posted in Agile Software Development, Architecture, Speed, Technology and tagged high scalability, scalability pit falls by Michael Maretzke. Bookmark the permalink.